The America the Beautiful coin series from the United States Mint is currently one of its hottest selling collectible issues. The 56-coin series features five new design releases each year, with one to represent each state, federal district, and territory of the United States. Right now, the 2016 5 oz Silver ATB Cumberland Gap National Historic Park Coin is available online at Silver.com. 32nd overall release and second of 2016. Obverse features President George Washington. Reverse commemorates the Cumberland Gap. Represents Kentucky in the ATB Series. ATB Silver coins are produced annually in both bullion and uncirculated versions. The uncirculated version of the coin features a finer finishes to the coin for added brilliance, while the bullion version such as these 2016 5 oz Silver ATB Cumberland Gap National Historic Park coins have a standard minting process. Each 2016 5 oz Silver ATB Cumberland Gap National Historic Park Coin listed here is a Mint State 69 product according to the NGC. Considered to be in near-perfect condition, these coins have full, original mint luster. However, they also have a maximum of two minor detracting flaws. 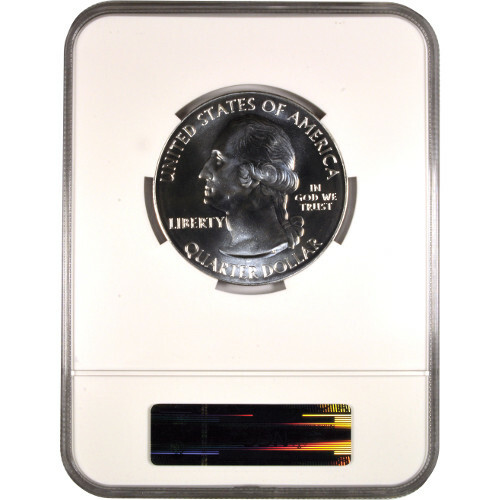 As a proof-like product, these coins are bullion products that have mirrored and/or frosted reliefs that give them the appearance of a proof finish. The result is often just a side effect of the coining and not intentionally done. 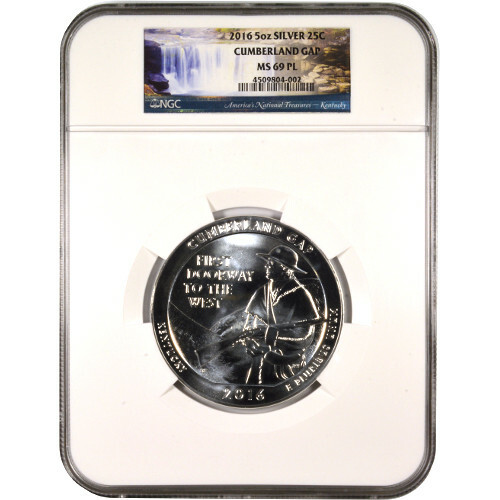 On the reverse of the 2016 5 oz Silver ATB Cumberland Gap National Historic Park coin is the image of an 18th century frontiersman looking out at the natural break in the Blue Ridge Mountains that is known as the Cumberland Gap. It was an easy passage way for early settlers and explorers to bypass going up and over the Appalachian Mountains. The obverse of all ATB Silver Coins feature the same right-profile portrait of President George Washington found on circulation quarters. This depiction was created in 1932 by John Flanagan and has appeared on the 25-cent piece since then. All ATB Silver Coins are produced by the United States Mint. The majority of the bullion coins in the series are released by the Philadelphia Mint and bear no mint mark. If you have questions, please don’t hesitate to ask. Silver.com associates are available on the phone at 888-989-7223, online using our live web chat, and via our email address.